Sounds like a plan, no? 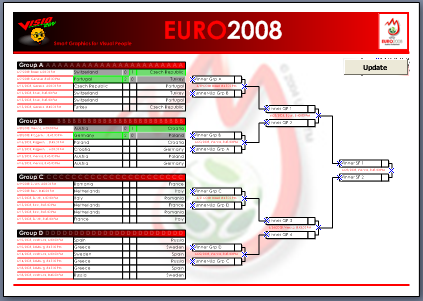 Well, with this wonderfully simple work-flow in mind, I’ve created a bracket diagram for the European Cup 2008 soccer/football tournament. 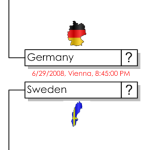 In case you haven’t heard, Euro 2008 is going on right this minute in Austria and Switzerland, and all of Europe is glued to the television. You sharp-eyed folks might also notice that the button is ugly. Therefore it was set to Non-printing (via the Format > Behavior dialog), so it won’t besmirch your cubicle wall. The Visio drawing contains VBA code that connects to a web service to get the latest scores and data. The diagram visually reflects the scores, the winners, the losers, and those who advance to the next round. If you don’t, the VBA code will not function. Your automated Visio document serves as a sort of digital dashboard, all you have to do is click Update and perhaps Print! All that automation is nice, but if you don’t want to bother with installing extra dlls from Microsoft, or messing with VBA Macro Security, then the drawing still functions manually. You can select each box and enter a team name or a score. Winners and losers will be shown, thanks to the underlying SmartShape technology used to create the diagram. Below, we can see that Austria turns green when they defeat Switzerland in the Quarterfinals. If the score is the same in the final rounds, then a penalty-kick boxes appear, so you can enter the results of a shoot-out. Above, Austria defeated Switzerland 5:2 on penalties. A note about the penalty kicks: The documentation for the web service that is used to get the match information was not clear on how penalties will be reported. It might be that the code in this document doesn’t properly handle penalty situations. If so, I will update the drawing so you can download a properly working version. Check back often! What technical post would be complete without comedy relief for tired eyes? Here’s a few videos from our sporting friends in Hungary and Italy to get you in the footie spirit! Nice that you added the flags! V2 (if theres gone be one) should also fix a small (very small) inconsistency, the group letters start at different points (The ones in the background, B is the most noticeable). One of our trusty readers (and Visio Experts – he’s arguably Smarter Than Me) had an error with the diagram with Visio 2007 Prop running on Windows Vista. There was a problem updating your diagram! -Client:An unanticipated error occurred during the processing of this request. Hopefully this will help some of you, if you’re having problems! The header shapes have repeating “AAAAA…”, “BBBBB…”, “CCCCC…”, “DDDDD…” text blocks in them. So the number of repetitions has to do with the font size, which really means the height of the font. The problem is that the “B” for the font is a bit skinnier than “A”, “C” or “D”, so 15 Bs isn’t as wide as 15 As. It would really be nice to be able to get character widths in Visio, or normalized string-lengths so that font-sizes, or repetitions could be handled more intelligently vis ShapeSheet formulas. I want to win the sharp-eyed tournament. 1) Is there a reason why you show the connection points ? 2) Why is there no place yet for the winner of the tournament ? cool! not sure if i’ll use it because i have visio at work and don’t want any spoilers as i watch the matches at home after recording. LOL @ the 3rd movie! It’s hilarious! Cannot get the bracket to work. Security settings info does not match the sample screens using IE7 with the visioviewer installed. What’s up? The Update icon appears but does nothing. IE7: nothing to do with it. Update icon? There’s an Update button on the Visio drawing page, when you open the drawing in Visio. Doesn’t work with the Visio Viewer. You have to have Visio installed. It worked fine utill now. Germany has won but has not yet taken its place in the Quarter Finales. I checked a text-dump of the web-service info. They haven’t updated the participants for the semi-finals yet, even though they should have. Let’s give it another day. I’m hoping for a penalty-kick situation tonight so I can see if anything breaks, then I can upload all the improvements. But I didn’t know how to check that at dataaccess. Croatia lost to Turkey on penalties: 1-1 (P 1-3) I can hear the Turkish honking in the streets. And it saves people who live in Vienna from ever getting in contact with Dutch supporters! Ok, the Germans are black and white. I think you are in need of the mythical “Global Stencil” or “Shared Masters”, which don’t exist, due to the local copies of masters that exist in the Document Stencil of every Visio file. Are your shapes changing physically, i.e. : in how they look, or are there data fields behind each master/shape that are changing, or both? If the utilities aren’t quite what you need, then Visio can be automated (as you have noticed) in quite sophisticated ways. My guess is that you’ll probably need something along these lines, since it looks like you are updating the layout of shapes, not just individual items.